Collapsing retaining walls, bowing walls, uneven floors and wall cracks are all signs of poor foundation structure. Foundation Supportworks by Baker's is a full service foundation repair company, specializing in foundation support, trench breaking, and geotechnical solutions. We have a staff of expert contractors and access to the right tools in order to create a stable, structurally sound building for any commercial application. The foundation is the core of your building, providing the strength necessary to support the entire structure of the building and all of its components. When significant damage occurs such as cracked walls, sagging floors and doors and windows that stick, you need to rely on a professional contractor to assist with the repairs. Our company is happy to provide foundation repair solutions for commercial buildings all throughout PA, OH, and WV including Pittsburgh, Johnstown and nearby. If you’re worried your building may be experiencing settlement, call us today! We work with all types of commercial foundation projects for property managers, commercial realtors, structural engineers, and construction sites. Foundation Supportworks by Baker's has the most efficient products and structurally engineered methods to provide permanent foundation repairs and new installation projects. Foundation Supportworks by Baker's can lay the groundwork for a quality, lasting commercial construction project. We offer a full line of push pier systems, helical anchors and piles, and crawl space jacks. All of these foundation support products are engineered for strength and stability to withstand even the most difficult areas of terrain. Contact our commercial foundation experts today! Foundation Supportworks by Baker's looks forward to each new commercial project we plan. 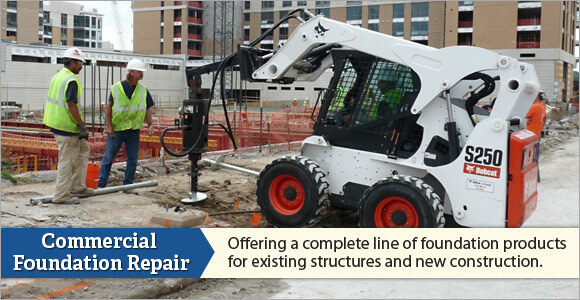 To start a commercial foundation project, or if you are in need of foundation repairs, call us for a free estimate. Our services are available throughout the PA, OH, and WV area including Greensburg, Washington, Mckeesport, New Castle.